In memory of Lance Corporal J.H. Ingham, East Lancashire Regiment, a Haslingden man who fell in action on October 9th, 1917, a service has been held at Laneside Church. The vicar (the Rev. J. Dodd) said the deceased was a single man, 23 years of age, and worked at Park Mill, Helmshore. He lived with his sister, Mrs. Walter Allen, at 3, Piccadilly Street, and had led a good life. As a member of the choir and of the Sunday School he had had a particularly useful career at Laneside. At the close of the service Mr. Hargreaves (organist) played "The Dead March." In loving memory of my dear brother, Lance Corporal J.H. 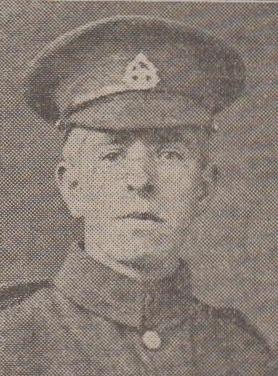 Ingham, 24291 2/5th East Lancashire Regiment who was killed in action in France October 9th 1917, aged 23 years. From his loving Sister Lizzie, 364 Manchester Road, Haslingden. Sadly missed by his Sister and Brothers and Nephew, Bobby 3 Piccadilly Street. Sadly missed by his sisters and brothers, and nephew Bobby, 3 Piccadilly Street. For we who loved thee well. From his sorrowing Sisters, Brother, also Brother in Law and Nephew Bobbie.